Life is funny. We’re in public even when we don’t want to be, and someone’s always watching. The process of being observed never ends, and artists who paint what they see have to decide what to show and how to show it. Alex Katz makes these kinds of decisions all the time, especially when the subject is Ada, whom he first painted in 1957, and married the next year, so you can see how crucial they are. She’s not just anyone but his wife, his constant muse and model, star, and he’s painted her in many divergent situations — as part of a crowd, or a landscape, in private, alone, or in multiple versions of herself in the same painting. The more than 30 here give a brisk overview of the way Katz has taken her singular look and presented it in different formal contexts, and whether public or private she’s always there as a symbol for something never spelled out, and thoughher look may be explicit, the secrets within are manifold. What is her artistic counterpart thinking in Ada and Alex (1980). Is she leading, following? Has something just happened between her and her husband? Are they going, coming? Caught somewhere? The picture gives few clues. But what it does give is two face to shoulder figures constrained, yet moving in the frame like a severely cropped update of a portrait by a Netherlandish painter like Hans Memling (c 1430/40 – 1494), who also defined his sitters by what they wear just as Katz does here. There’s Ada’s suitably muted coat, red blouse; her husband’s suit, white shirt, tie, and then of course their sober-looking faces, like prosperous yet somehow uneasy burghers which gives the picture a Yin-Yang tension like that in the artist’s monumental 1991 Fidel and Yvonne. In both cases the man’s positioned somewhat recessively behind the woman, who, if not controlling, does seem to be protecting him somehow. Protection issues seem to rise to the surface in Ada and Vincent (1967), where she looms above her son, who’s since become an accomplished poet and critic. The cropping here is even more extreme than in Ada and Alex. Here mother and child impose themselves on the viewer like a floating dream moment — Ada totemic, mythic, Vincent afraid as any 7 year-old in the world, and it’s this vulnerability, or fragility, if you will, never remarked,henceitsimportance, that goes through many Katz portraits. Even the sitters in his huge ones are obviously human in this regard. It’s there in Ada in the Park (1965) in which she’s seen filling most of the picture plane again, in a soft blue nearly lavender scarf, the light of a winter day in a park — Washington Square? — caught dead on. It looks impossibly cold, and Ada’s isolation — is he sad, lost? — rings loud and clear. Katz’s traditional training, which encouraged him to paint outdoors, has undoubtedly contributed to his acute sensitivity to light, weight, and scale, and it’s there even in the flat dead white fluorescent interior of The Cocktail Party (1965) where Ada’s dramatically hidden. Light makes a spectacular appearance in the beach scene, Round Hill (1977), with its complex arrangement of figures and sexual tensions, and its presence on Ada’s figure alone in The Walk 2 (1962) — the background’s an even blue black — gives her image its kick. It isolates her in Ada in Polka Dot Blouse (1975), where she’s standing in front of part of Katz’s iconic trio of mother, son, and father in his infinitely mysterious Walk (1971), but her image there is tellingly left out. Isshemeditating on its absence? Maybe. And yet her presence is everywhere, and everywhere transformed in this quietly seductive show. It’s there in the stunningly serene Blue Umbrella 2 (1972), and it’s no less center stage in the curiously moving letterbox format — Katz’s views often suggest films — of Ada (2005), where she looks almost unbearably pensive. And then there’s Good Afternoon 2 (1974), where she’s alone in a canoe heading towards the light, like an unnamed goddess rowing towards eternity, or at least its emblem. This is a rich and quietly provocative show about the pleasures and perplexities of looking. And though Katz’s art has often been described as cool, I think it’s more effectively approached as one that’s terse, objective, frank, and at its best endlessly suggestive, the paradox being, of course, that the closer we get to something or someone, the more that thing or person recedes. This is what gives his work its poetic charge. The bigger the paintings, the more intimate they look and feel, like someone we know and care deeply for. Reproductions of his work won’t do. See this one live. 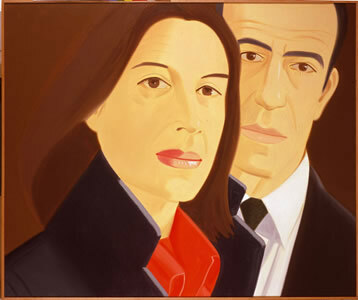 Alex Katz Paints Ada is at The Jewish Museum till March 18 2007. 1109 Fifth Av @ 92nd St, New York NY 10128. 212 423.3271. www.thejewishmuseum.orgThe spectacularly produced cataloghas three cogent essays, including one by the Katz’s late New York School poet friend, James Schuyler.